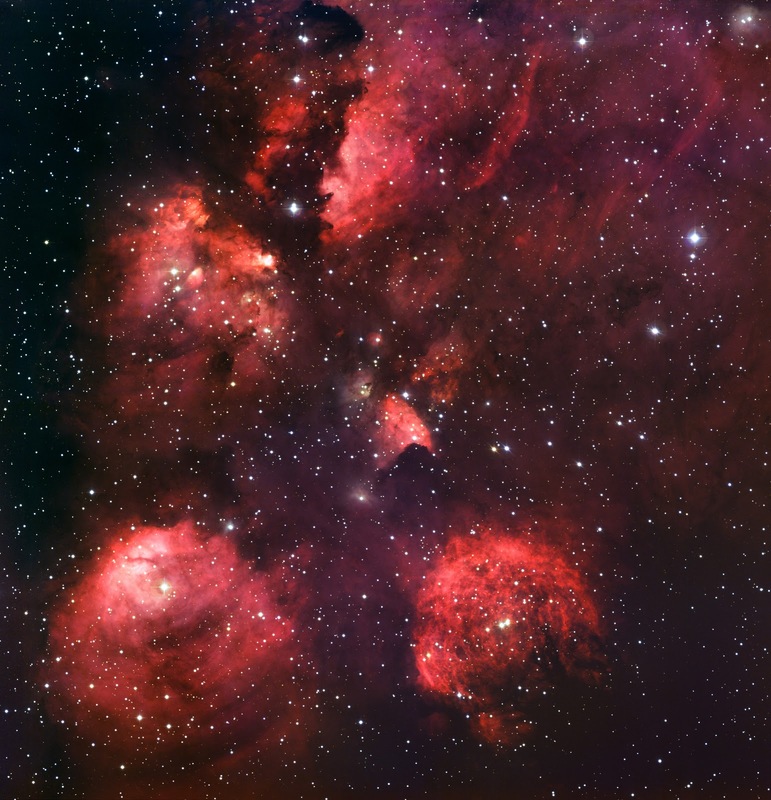 The Cat’s Paw Nebula (NGC 6334) is a vast region of star formation. This new portrait of NGC 6334 was created from images taken with the Wide Field Imager instrument at the 2.2-metre MPG/ESO telescope at the La Silla Observatory in Chile, combining images taken through blue, green and red filters, as well as a special filter designed to let through the light of glowing hydrogen. NGC 6334 lies about 5500 light-years from Earth in the constellation of Scorpius. The whole gas cloud is about 50 light-years across. NGC 6334 is one of the most active nurseries of massive stars in our galaxy and has been extensively studied by astronomers. The nebula conceals freshly minted brilliant blue stars — each nearly ten times the mass of our Sun and born in the last few million years. The region is also home to many baby stars that are buried deep in the dust, making them difficult to study. In total, the Cat’s Paw Nebula could contain several tens of thousands of stars. The nebula appears red because its blue and green light are scattered and absorbed more efficiently by material between the nebula and Earth. The red light comes predominantly from hydrogen gas glowing under the intense glare of hot young stars.